With the inclusion of the XTherm Therm-a-Rest now makes a full line of NeoAir pads covering a large spectrum of anticipated temperatures, allowing hikers to build a NeoAir-centric quiver of pads. But to tell the truth the XTherm can be a quiver of one, as it is now for my son, who helped me review the pad. The warmest NeoAir so far it does not give up much weight to their lightest versions. It worked for us at some pretty low temps. Please read on for the details. 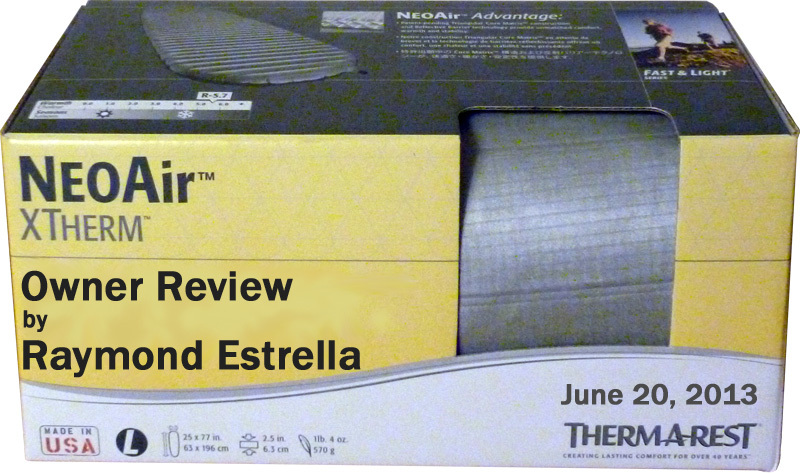 The XTherm is the newest addition to the now-large family of NeoAir models. It is also the warmest boasting an impressive 5.7 R-value. From the outside it looks to be much like all the other models, but there are hidden differences that account for its higher rating. The outer shell is made of 30 denier high tenacity nylon that is a silver-ish color that Therm-a-rest calls Reflex Gray. The dark gray 70 denier bottom is made of what they call "Soft Grip Nylon". It feels like a urethane coating has been applied to the outer surface to me. At first glance my XTherm appears to be comprised of 46 air chambers running horizontally across the pad. But actually there are 183 chambers. This is because of the patent-pending Triangular Core Matrix technology, common to all the NeoAir models, that creates "an internal truss system" which Therm-a-Rest attributes their exceptional stability to. Each chamber visible on the top and bottom is actually a triangular wedge that goes to a layer of PU coated nylon in the middle of the bag. That means that for every chamber that is visible there is another inside the pad on each side of the internal coated nylon layer, plus two wedges not visible from outside. 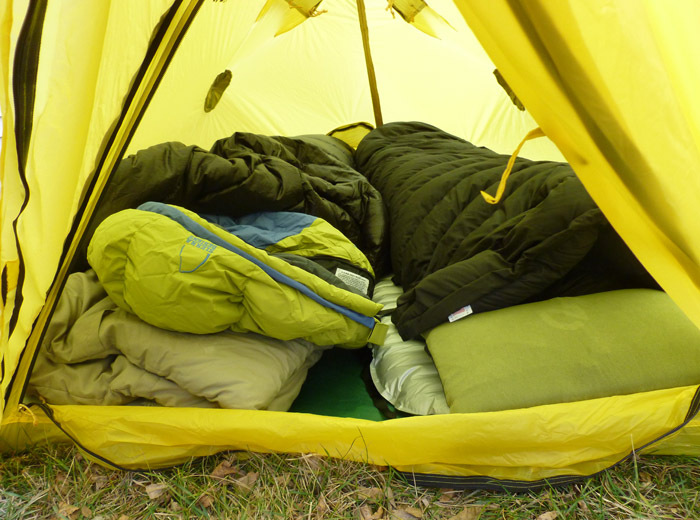 This pattern makes four layers of dead air between the sleeper (top) and the ground. The triangular shape also gives the pad structure and keeps it from squishing out of shape under the weight of the user. While the many small chambers give some insulation by creating dead-air space, the many surfaces inside also slow down and block the flow of warmth from the user's warm body to the cold ground and vice versa. To further the warmth-retaining properties the air chambers and the center layer of nylon have been coated with a reflective surface, much like a Mylar space blanket. This reflects heat back towards the user. Now to make the Xtherm even warmer yet Therm-a-rest added another two layers of Mylar film which are welded to the shell, one on top and one on the bottom. While the film is attached it is not completely glued so it has an air gap between the shell and the film, and between the inner chambers and the film. This gives the XTherm another four layers of dead air space bringing the total to eight. To save on weight the XTherm is made in the tapered mummy-shape that was first used on the NeoAir XLite (see my review here at BGT). A couple of welcome additions are the inclusion of both a stuff/pump sack and a repair kit. The combination pump-sack/stuff-sack weighs 1.45 oz (41 g). When folded in thirds and then rolled up the XTherm Regular is just a bit larger than a 1L Nalgene bottle, while the Large is larger yet, as may be seen above. 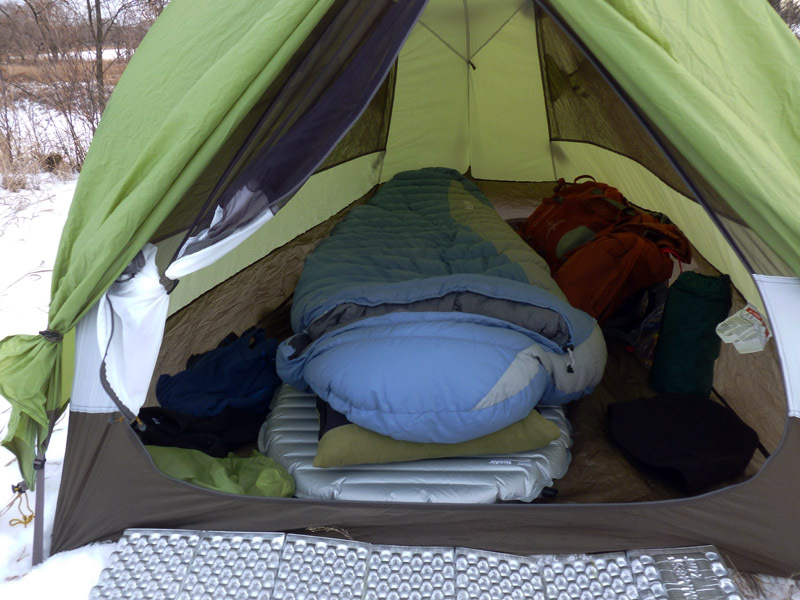 My son used it on two snow camping trips. One was in a snowstorm that dumped a couple feet of snow (0.5 m) but only got down to 15 F (-9 C). The picture above was taken before the storm hit. When we went to bed I had to dig the tent out to enter. The next trip saw his new personal low of -13 F (-25 C). I used the regular XTherm in Chippewa National Forest for two hikes, one to Hovde Lake where it got down to -1 F (-18 C) and saw a little scattering of snow. The next week I was in the same area but went to an unnamed lake further east. This trip saw more snow but warmer temps with a low of 10 F (-12 C). Here is a shot of it at Hovde Lake. 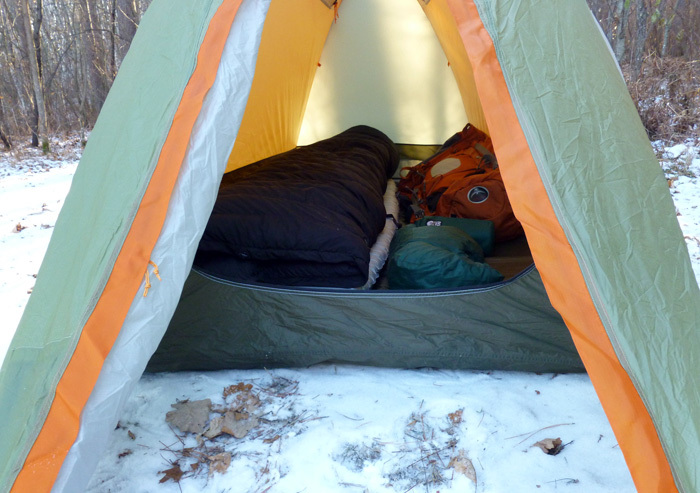 I used the Large on the snow-camping trips with my son, plus for eight backpacking trips. Five were on the Red River either on my friend's property north of Halstad, Minnesota, or north of my own town, one was on the North Country Trail by the Anoway River in Chippewa National Forest, one in Smokey Hills State Forest, and the last on the North Country Trail in Paul Bunyan State Forest. These trips were cold with lows averaging around 0 F (18 C). The trip on the Anoway River saw -22 F (-30 C). A backyard test night saw its lowest temp of the year hitting -24 F (-31 C). Here is a shot of it on a trip that saw -12 F (-24 C). Winter is the scariest season to rely on an inflatable air pad in my opinion. I have been doing so for many years with down providing the insulating value. When I heard of the XTherm getting an R-value only 0.3 less than one of my down-filled pads I was a bit skeptical. Fortunately I found that it really works to the rated values as I could not tell much difference between it and my R-6 pad. 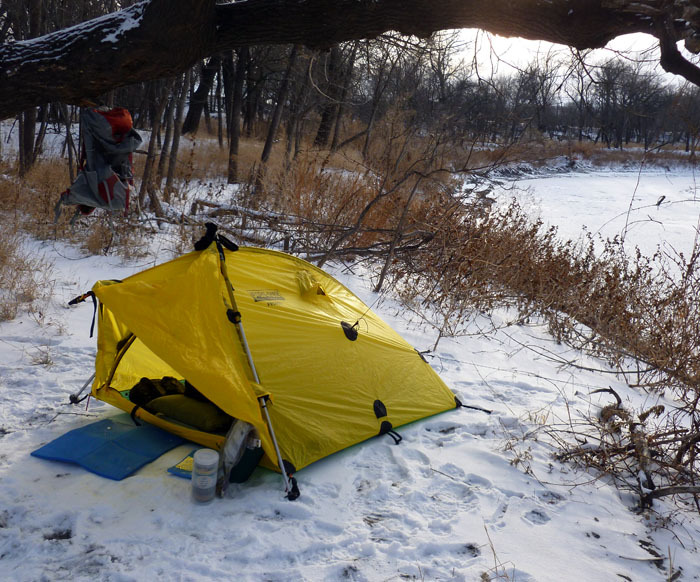 I use a quilt a lot, going down to 0 F (-18 C) and even below often with one. When using the Regular size I found that I was too cold, just because I could not keep my big body on it properly. 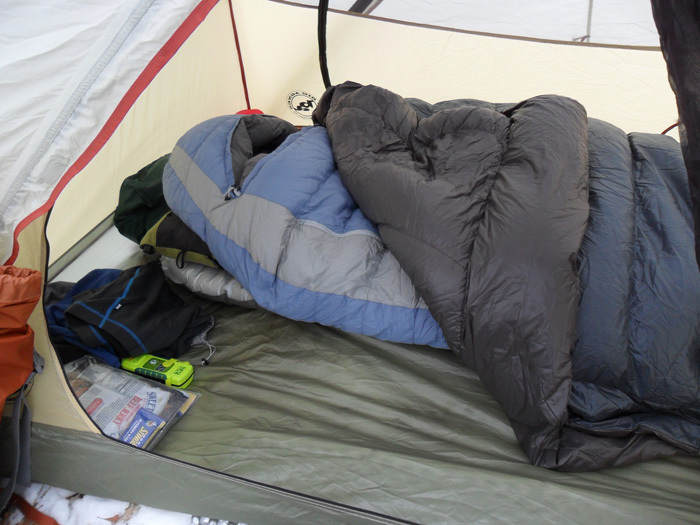 The first winter I stopped using the XTherm with my quilt. I did use it with a couple extreme winter bags though, where it worked very well. This past winter I got the Large and was able to use it with my quilt just fine. I had a few nights quilting with it before I switched to a new winter bag and bag/quilt combo that I used for the rest of the winter and early spring. The extra width is quite noticeable for this toss-and-turn side-sleeper. Like all my other NeoAirs the XTherm is very comfortable. I do not inflate it hard so as to let my shoulder and hip be allowed to compress the pad. The XTherm is very stable and I feel the horizontal tubes work better than the lengthwise tubes of my other pads. With both the quilt and the new bag (seen in the picture above) the XTherm was providing all my bottom insulation with no real contribution from my sleep gear. I did start feeling a bit cold when getting below -10 F (-23 C). And even when I was fine I had to be concerned about the possibility of a catastrophic, non-repairable puncture while in the field. Because of this I carried a ZLite pad for just in case. (I always have with my other winter pads too.) I did have to add the ZLite below the XTherm on a few occasions, all below -20 F (-29 C) for low temperature. I can really notice the extra layers of film that they added to the XTherm. When I unroll the pad it actually starts inflating itself as the inner structure separates. I call it a semi-self-inflator. By the same token it keeps air in when deflating. I need to lie on it just like I do for the down pads to get the air out before rolling it up. The durability of both XTherm pads has been good. No leaks to date and the Regular saw use on limited or no snow cover so had sticks poking it at times. Probably the neatest thing about the XTherm is its weight. The Regular is the exact same weight of my original Regular NeoAir. My Large XTherm is only 1.4 oz (40 g) heavier than my same-size XLite. For this reason my son is taking the XTherm as his year-round pad, a quiver-of-one if you will. If I were forced to give up all but one pad I really think I would do the same thing myself. I leave with a shot of it on the Red River.